La versión español está después de la primera foto de la primera foto. MEDICANE LESLIE RECENTLY struck our area. It sounds like the name of an American healthcare plan (like Medicare or Medicaid) — or, perhaps, a drag queen. But, news to me, medicane is the term commonly used to refer to hurricanes over the Mediterranean Sea. 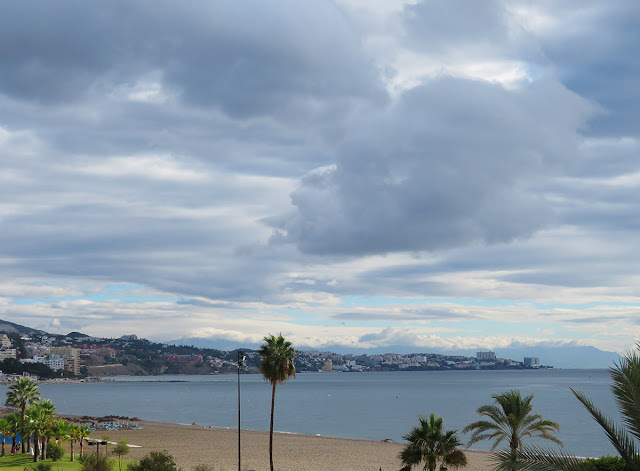 We had very little impact here — some winds, some rain — but apparently Leslie (finally post-tropical cyclone Leslie or something like that) didn't want to leave the Iberian Peninsula. Well, can you blame her? So, it rained again last night and the wind howled. 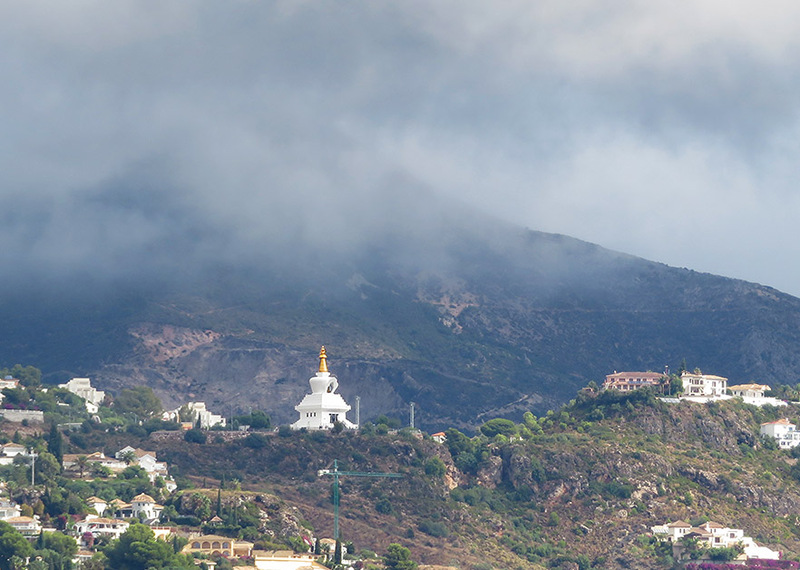 CLOUDS OVER THE BUDDHIST ENLIGHTENMENT STUPA, BENALMÁDENA. 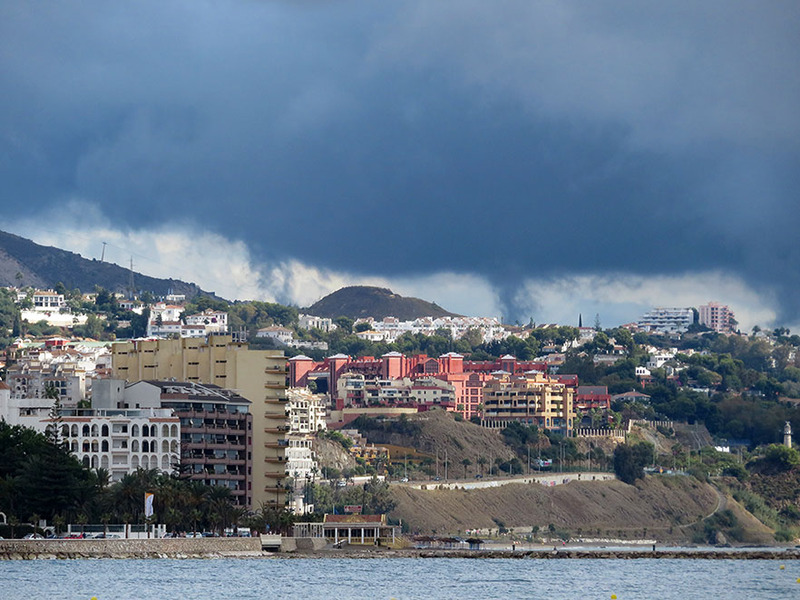 NUBES SOBRE LA ESTUPA DE LA ILUMINACIÓN, BENALMÁDENA. "MEDICANE" LESLIE RECIENTEMENTE golpeó nuestra área. Suena como el nombre de un plan de cuidado médico de los Estados Unidos (como Medicare y Medicaid) o, quizás, una drag queen. Pero medicane es el término comúnmente usado para referirse a los huracanes sobre el mar Mediterráneo. Tuvimos muy poco impacto aquí, algunos vientos, algo de lluvia, pero al parecer Leslie (finalmente el ciclón post-tropical Leslie o algo así) no quería abandonar la Península Ibérica. Bueno, ¿puedes culparla? Así que, llovió de nuevo anoche y el viento aulló. Dance in the rain, and loll in the sunshine. That second to last photo is gawgeous! Aw, thanks. 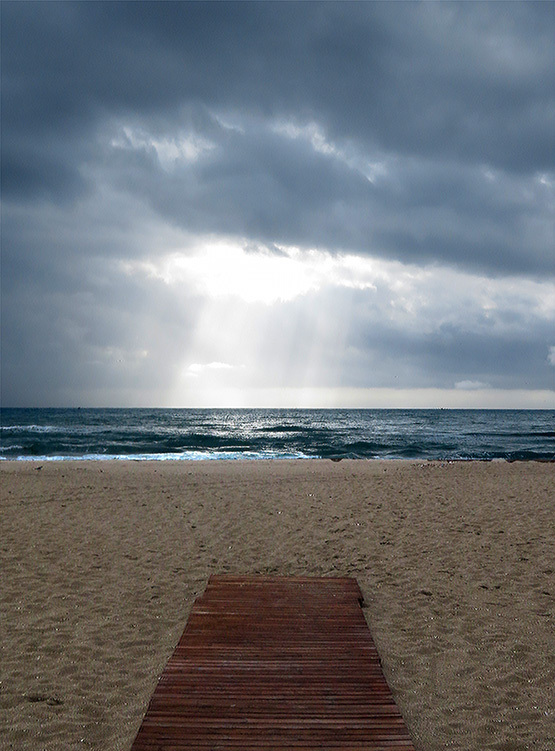 Just a brief step onto the beach. Heard of hurricane Leslie over here. Can't remember who I was talking to. Great pictures....a but intimidating. I do love a good storm. Although I’m sure those hit hard by it don’t feel the same. We were lucky. You've taught me a new word today! 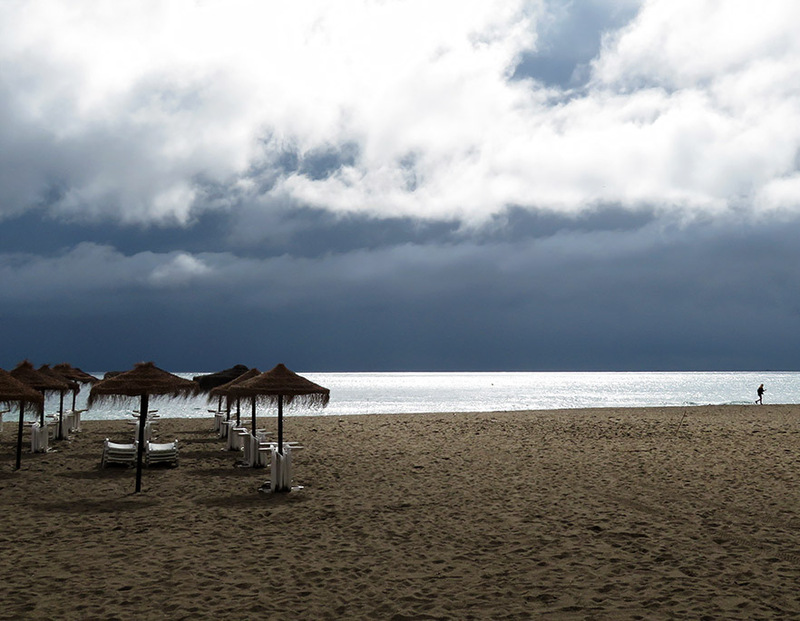 Dramatic photos - you can almost feel the energy of the weather. It was t much as windstorms go here, but the clouds were dramatic. Medicane, huh? Sounds like it should leave the scents of menthol, eucalyptus oil, and camphor in its wake! Awesome pictures. I don’t know how I’ve lived this long without ever having heard this word. Never heard that word before. As I live in Cleveland, I wonder if there's an Eriecane. And in Nova Scotia I’ll bet it’s called a Novacane! When Trump s done it will be Medí nothing. Born in the USA... the tragic ironic meaning of Bruce Springsteen’s song, not what the GOP use the song for! Mitchell, do you ever paint your photos... you know, I mean, do a painting of one of your photos. Ever? I’m sometimes inspired to, but I never was big on doing landscapes. I love drawing people. Instead I paint these with the camera. The southern corner of France near the Spanish border on the Mediterranean has been getting walloped. Lost of rain, flooding, and loss of life. Must be part of the same system. Locally I had no clue how bad it was... except for what I’ve seen on the news. Can't beat a perfectly straight horizon, I say!! Nice job! Thanks. Pretty good for someone who currently sees the world in a blur, huh?!? Please visit www.movingwithmitchell.com if you'd like to comment or stay up to date. I stopped posting here 25 September 2018. Thanks!!! Original photos and content © Mitchell Block. No commercial use. NO USE WITHOUT PERMISSION.. Awesome Inc. theme. Powered by Blogger.